By making a regular donation, you give more than just money! What is a Hero with Heart? It’s anyone who chooses to make a regular donation to Variety. Sign up today to give regularly and become a special Hero with Heart. The amount and frequency are completely up to you. You’ll join the Variety family on an inspiring journey, making a real difference by empowering children who are sick, disadvantaged or have special needs, to live, laugh and learn. If you want to do something that is easy and amazing on a regular basis, our Hero with Heart regular giving program is the perfect way! It’s as easy as 1, 2, 3. Choose the ‘frequency’ which suits when you enter our donation page. Pick the amount you wish to donate. We’ll automatically get your donation at your selected frequency. You can call us to change or cancel at any time. Smile! Because every month you are a Hero with Heart helping us be there for Aussie kids in need! Because of your generosity we can plan confidently and budget more effectively. That means that we can say “yes” to more families who need help now and into the future because your regular gift will provide a steady and ongoing funding source. Start feeling great today! Donations $2 and over are tax deductible. We will provide you with an annual receipt summary for your tax purposes. That means less money spent on admin and more money going to help Aussie kids in need. Annika lives with continuous and debilitating back pain and increasingly restricted ranges of limb movement as a result of long periods spent sitting or lying. 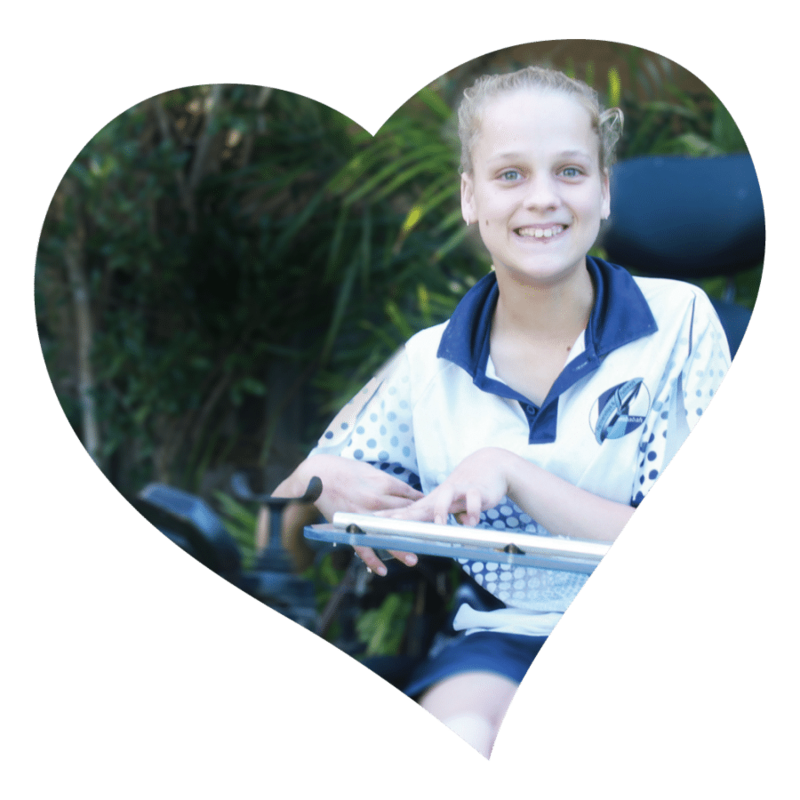 Annika is 16 years old and lives with Quadriplegic Cerebral Palsy. Despite her challenges, Annika enjoys attending high school and in many ways she is much like other children her age. She has even learnt to ‘speed type’ using her nose when on messenger to her friends. However, the help that Annika now needed most was a very specialised powered wheelchair, with a standing function to regularly move her young body, help reduce her constant back pain and give her more freedom and confidence by providing life-altering physical therapy benefits and freedom. Financially this was simply out of reach for the family unfortunately. This is where Variety – the Children’s Charity was able to step in. Thanks to the generosity of our many Variety supporters, Annika was granted her standing chair which has endless benefits to her quality and enjoyment of life. Annika can now move herself into a standing position, which not only has health benefits for her but also emotional benefits like, as Annika said “not having my friends look down on me”. She can be at eye level with her peers and stand up for things like graduating from high school and attending her school formal which will all happen in the next few years as she transitions into young adulthood.